Extra Judicial Killing: Total 4: 3 killed in ‘gunfight’ by Police, 1 missing person's dead body recovered. Total 4: 3 killed in ‘gunfight’ by Police, 1 missing person's dead body recovered. 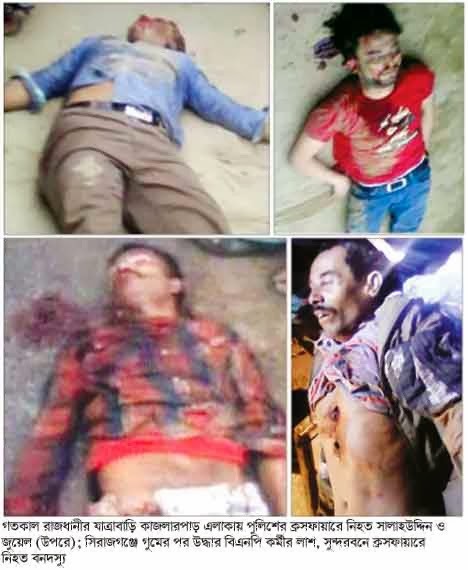 By Bangladesh Media; The number of deaths in Crossfire, Gunfight, Shootout are rising in Banglash. Three more people were killed in different cities in Bangladesh. One more dead body of a disappeared persson was found in Sirazgonj district. Spot Dhaka: Two people were killed in a ‘gunfight’ with the police in the capital’s Jatrabari area on Saturday afternoon.The deceased were identified as Salahuddin, 28 and Jewel, 30. The police claimed that the deceased were robbers and they were wounded in gunfight with police.They were taken to the Dhaka Medical College Hospital, but they succumbed to their injuries on the way, said Demra zone assistant commissioner Md Mohiuddin Ahmed. The police said that they had chased three accused persons including Salahuddin and Jewel at Kajla around 4:00pm. Salahuddin and Jewel were detained in that drive, however, their associate managed to flee.Later, the police carried out another drive along with the two arrested robbers in the Sutir Khalpar Balur Math area to recover their illegal firearms around 5:00pm. As the police reached the area, some other associates of Salahuddin and Jewel opened fire on them. The police returned the fire, triggering a gunfight with the miscreants, said Jatrabari police sub-inspector Emranul Islam. Salahuddin and Jewel had sustained bullet wounds in the gunfight and breathed their last on their way to hospital. Spot Sundarban: One person was killed in Karamjol area of Sundarban on Friday. His name is Shiraz Shikdar. Shiraz was arrested on Friday morning from his father in law's house in Tuzulpur village in Rampal upazila of Bagerhat district. Police demanded that, -in an interrogation after arrest Shiraz confessed that he have had fire arms in his possasion, which is hidden in somewhere in Karamjol of Dakop thana. According to police, -Paikegasa thana police along with Shiraz went out to recovery firearms in Karamjal area on Friday afternoon. Sensing police present Shiraz's friends opened fire on police. Police defended themselves firing back to them. Shiraz tried to escap and was finally caught in line of fires resulted him death on spot. Police Super of Khulna Golam Rouf Khan said that a case was filed in the Dakop police station. Spot Sirazgonj: Dead body of a disappeared person was found nearer to the Jhaoul bridge area of the Kamarkhand Uppozila of Shirazgonj District. He was identified as Zahangir Hossain 35, the son of Dela Hossain from Mohonpur, a village of Saydabad Union Porishad in Sadar Upozila. Officer in Charge of Kamarkhand police station Rezaul Karim informed that Zahangir have been a victim of bullete injury. He was shot 6 times in his back head and back side of the body. He was wanted for a long time because he is an accuse for the Sirazgonj Awami Leagu leader Saiful Murder case. Mother of Zahangir, Joygun Begum told to the daily newspaper Prothom Alo that, her son Zahangir was arrested about a month ago in Dhaka Board Bazar area. Since then Zahangir was traceless. It could be noted that another accused of the Awami League leader Saiful murder case name Bablu Mia was killed in a gunfight with Rapid Action Battalion (RAB) at the dam area name Chaina Harbar of Sirazgonj, dated on 30th January of this year. Joban Ali, the main accused of this Saiful Murder case was also shot dead. 06 February his dead body was found in Konagati area of Sirazgonj - Kodda road.